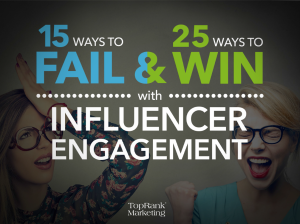 The difference between an epic fail and big win with influencer engagement is all in the small details. This new eBook features advice from 15 top marketing influencers on the biggest reasons they’ve not said yes to an influencer request. Inside you’ll also find 25 tips to help you create better relationships and add more value for influencers. Let the experts help you create a winning influencer marketing program. Schedule a free consultation today.